G2 Gives aims to provide a unique bridge between the business world and the nonprofit community and directly reflects G2 Crowd’s commitment to compassion and authenticity. G2 Gives review campaigns further G2 Crowd’s mission of bringing transparency to the B2B marketplace and support worthy causes around the world. G2 Crowd and New Story plan to build a community of 80 homes. Each home is built by local labor and built with locally sourced construction materials. The intent is to stimulate the economy and teach valuable skills to members of the community. The homes are designed with the input of their future inhabitants to best provide solutions to the problems they face every day. New Story Charity was co-founded in 2014 by Brett Hagler, Mike Arrieta, Alexandria Lafci, and Matthew Marshall. The charity builds homes and transforms slums into communities to provide families and individuals with safety and consistency. 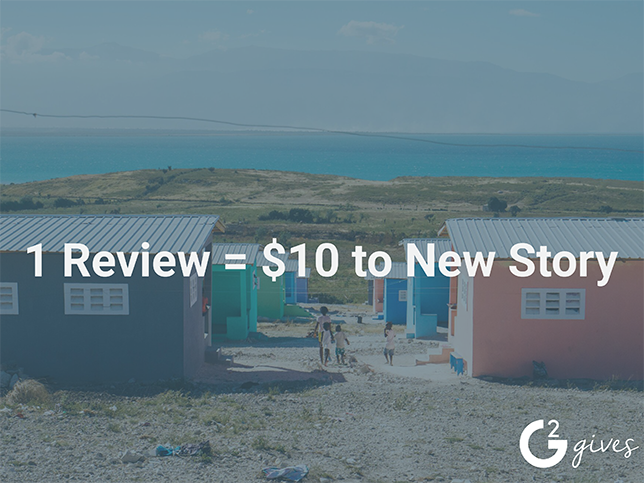 One hundred percent of funds raised go directly toward hiring local workers, buying local materials, and building the homes. This 100 percent commitment gives donors transparency to the process and confidence that their donation will make a direct impact. This partnership between G2 Crowd and New Story Charity furthers G2 Gives in its mission to connect the business community with nonprofits. Previously G2 Gives has raised funds to support initiatives like World Water Day and Chicago Technology Academy. G2 Crowd, the world’s leading business solution review platform, leverages more than 200,000 user reviews to drive better purchasing decisions. Business professionals, buyers, investors, and analysts use the site to compare and select the best software and services based on peer reviews and synthesized social data. Every month, nearly one million people visit G2 Crowd’s site to gain unique insights. Co-founded by the founder and former executives of SaaS leaders like BigMachines (acquired by Oracle) and SteelBrick (acquired by Salesforce) and backed by more than $45 million in capital, G2 Crowd aims to bring authenticity and transparency to the business marketplace. For more information, go to G2Crowd.com.